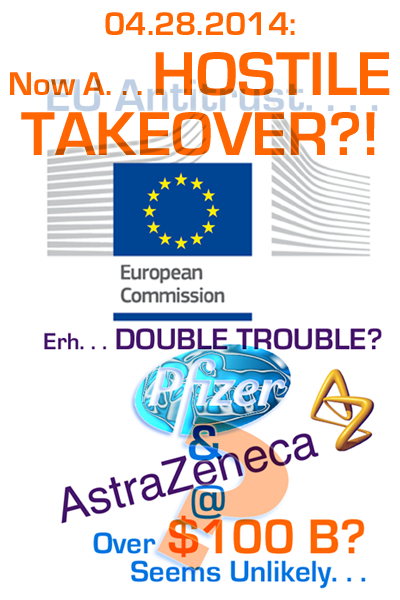 Ian C. Read’s Pfizer Offer, For AstraZeneca: Now Clearly HOSTILE. Sheesh. Okay. This is wild , as I would have guessed Mr. Read was smarter than this — or at least less stubborn . Pig-headed , actually.
. . . .We made our intentions public to communicate what we believe are the benefits of a potential combination to shareholders of both companies, and to make clear to all our stakeholders the many advantages such combination of Pfizer and AstraZeneca would present. And we believe pursuing a potential transaction would support our recent reorganization into three new commercial businesses. . . . The revision of the General Chapters on Good Distribution Practices (GDP) has highlighted in a new USP chapter the safety and integrity of the supply chains for starting materials and medicinal products. More information can be found in the News. (<1079>, <1083> and <1197>) has shown that the contents partly overlap each other. That’s why these GDP chapters should be reorganised from a higher perspective. throughout the supply chain to delivery to the end user. They apply to APIs, excipients, as well as to medicinal products and medical devices. procedures, and technologies which are used to ensure visibility and traceability of products. from entering the supply chain – and, as a matter of fact – the market. In early April 2014, the EU Commission has published a new Chapter 6 Quality Control. The new chapter will become effective on 1 October 2014. Read more in the GMP news to the new EU GMP chapter quality control. In early April 2014, the EU Commission has published a new chapter 6 Quality Control. The new chapter will become effective on 1 October 2014. The main reasons for the changes (as e.g. the insertion of a new chapter on transfer of analytical methods) were already subject of our news Revision of the EU GMP Guide: EU Commission Proposal for Chapter 6 – Quality Control). According to 6.9 now all Out of Trend (OOT) and all Out of Specification (OOS) results have to be considered and need to undergo an investigation. Also, in 6.12. a new requirement asks for a sampling plan based on risk assessment. Further content supplements (in addition to others) deal with the subject of reference standards. The newly inserted text under 6.20 states “… their qualification and certification as such should be clearly stated and documented. Whenever compendial reference standards from an officially recognised source exist, these should preferably be used as primary reference standards unless fully justified (the use of secondary standards is permitted once their traceability to primary standards has been demonstrated and is documented). These compendial materials should be used”. The regulations with regard to “Technical Transfer of Testing Methods” starting with point 6.37 up to 6.41 are completely new. All attendees of ECA courses and conferences can download a document comparison between the current chapter 6 and the new version in the ECA website members’ area. In this comparison all changes and additions are marked. Otherwise please also see the new Chapter 6 Quality Control for more information. milestone payment from Sanofi on a collaboration of its VLA2 (alpha2-beta1) integrin monoclonal antibody. GBR 500 is a first-in-class therapeutic monoclonal antibody for chronicautoimmune disorders. Scientists have developed a pill which they claim could help paralyzed people walk again.